The survey was carried out between August 2012 and February 2013 and was answered by just under 2,100 football fans. 17 clubs’ main rivals have changed since 2003. Leeds United have the most teams considering them as main rivals with four. Manchester United and Nottingham Forest are joint second with three each. Gillingham have the fewest rivals, appearing in no club’s top three rivalries. 52.2% of fans believe that geographical proximity is the cause of their main rivalry. 34.7% blame it on history whereas 8.2% think it’s down to league position. 73.9% of football fans claim they would miss their rivals if they ceased to exist. With 3 points allocated for having one main rival and two for having a secondary rival etc., here is a ranking of clubs with the most rivals in the Football League. 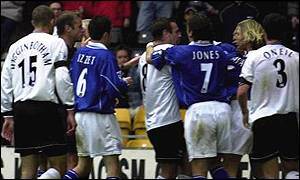 Rivalries – Who are they? All stats compared with 2003 Football Fans Census : Rivalry Uncovered. However, this survey is not affiliated with the Football Fans Survey. No, you dipshit, it’s Nottingham Forest. We are not Notts County. We are NOTTINGHAM. Whatever. Like he said, we hate Notts Forest. Is that the cross between Forest and Notts County? No, it’s what people who hate Florist call them cos we know it winds them up. And the source for this information is where? On what basis were non-league clubs excluded to avoid fraud? What defines a neutral fan? Without answers to those questions, this is merely a list without context, nor any value. Read the earlier comment re fraud. You won’t be able to view my results without having my password, which I obviously won’t disclose. Historically, Villa have been West Brom’s main rivals since the late 19th century. Wolves only became thought of as WBA’s main rivals due to the fact that we were at a similar levels in the league for much of the 1980’s, 90’s and 2000’s. Watford? Main rival of Leeds? What are you smoking? It would likely have been Luton had I been able to include non-league clubs. But that’s what Watford fans voted. i’m surprised Man Utd don’t see wednesday as their biggest rivals, a mistake surely? Well you probably should have voted then shouldn’t you? haha! I like the irony in your post! You say Wigan wish to be Bolton’s rivals? Then pronounce Man United are your rivals as if you’d even be in their top 10, you’re a funny guy. I can’t explain that. The survey provider has to. It’s ‘Kwik Surveys’ if you want to enquire. Unfortunately, this was just a bit of fun and I think you’re taking it far too seriously. Hate Palace always have always will and the feeling is mutual —perfect . Brighton . Some really strange results here. Seems to me that it was only male fans of a certain age group were asked the questions. Think you would get a different result if more older or female fans were asked. How the hell can Hull and Stoke say that Leicester are one of their traditional rivals?? The point on the age group is right though – if you went back to 2002 many Stokies would consider Cardiff as a rival, and back in the grim 90s even Stockport County – heady days in the lower leagues indeed! But traditionally Stoke v Port Vale (Potteries derby), Stoke v Wolves (Staffs derby of old) and probably over the last 30 years Stoke v West Brom given vicinity and the two teams following each other up and down the leagues – I was at a Div 2 game in about 1991 when 30k turned up to watch a Baggies v Stoke game (inc 9000 Stoke) – was epic! Stoke v Derby & Brum has always been a lively affair, Crewe/Shrewsbury only really relevant when in similar leagues, and for a lot of older Stokies they see Man Utd & City, and Arsenal as ‘rivals’ from the 70s. The Arsenal one nearly coming back under Pulis! I’m just surprised that Sheff Wed’s top 3 rivals aren’t Man Utd, Chelsea and Man City given their perceived “massiveness” and delusional support. no mention of Bournemouth and Portsmouth! Swansea v Reading – Lol !!!!! I’m a Leeds United fan and in no particular order I would say our rivals are every team which isn’t Leeds United. Only Leeds United fans love Leeds United and I’m proud to say that’s millions all over the world, we are a 1 club city, we have been through hell and back both nationally and internationally but the fans still support the club. An awesome club we are despite our current time outside the PL. But if I was to mention a few, basically any other Yorkshire team as they are local derbies, any Lancashire team due to Yorkshire vs Lancashire, then you look at history, some teams we have cup history with, and then just the clubs who we hate the fans of, I’d like to mention galatasary as their fans killed 2 of ours, someone mentioned how Bolton fans killed some of another, we know how you feel, football should be about the love of the club and the sport, not about which fans can kick the crap out of another clubs fans and in some cases killing them. A quick mention for the sick group from the millwall fans who love chanting horrible crap relating to the stabbings in Turkey, you ain’t proper football fans, back off and stay away, you’re lucky the Leeds United fans haven’t come looking for you, coz if they had, you would be appearing in dog meat tin cans! what a load of old tosh… everybody hates everybody….its just the way it is….the softest of football fan will get involved in violence given the right circumstances, its the game, its the fans. take away the rivalry and there is no football no point, no nothing. What this list really brings out is just how delusional and despised Leeds are; Manchester United and Liverpool can always expect hate given their overwhelming and admittedly annoying levels of success, but Leeds are in the Nottingham Forest bracket of previously massive clubs that aren’t competing at the very top anymore, yet Leeds remain despised. Plus I don’t think the likes of Chelsea really give 2 figs about them. Or even Man Utd now they’ve got City to concentrate on.